The advantages of teamwork between German TV broadcasters and third party production companies have been demonstrated on many occasions. 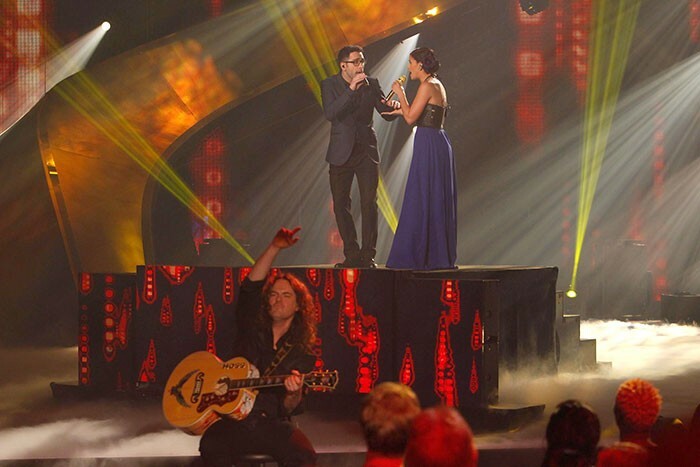 The latest example could be seen when Schwartzkopff TV collaborated with Talpa Distribution for the latest season of The Voice of Germany. This enabled lighting designer Manuel da Costa – once again working with an established team of lighting and video specialists – to bring Florian Wieder's stage set to life with some inspired lighting dynamics. 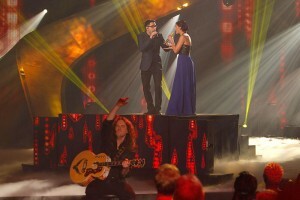 For the first time at the Berlin finale, a Christie YK200 and Christie MicroTiles were used, the latter serving as a podium for the duet between one of the finalists and international star Nelly Furtado. It was last year that Manuel da Costa first experienced the YK200, using the powerful moving head projector in the course of a live TV show. The Christie YK200 from the Nitro Solution series is a motorised moving yoke with a digital projector. It was developed for the operation of high-performance projectors with a light output of between 12,000 to 22,000 ANSI lumens. Da Costa was once again able to rely on the device: "The Christie YK200 worked reliably and precisely as it had at DSDS (the German version of Pop Idol) and this facilitated fast and exact positioning of the projector. It is something that is particularly required within a live show, where highlights are seamlessly aligned, and where the design has to be unique time after time." A Roadster HD20K-J, with a light output of 18,000 ANSI lumens, provided the appropriate lighting performance, combining the image quality with the reliability of DLP technology. The video content from Falk Rosenthal was provided in standard format for all spaces and was controlled by a grandMA2 via ArtNet. Manuel da Costa continues: "The whole thing functioned completely smoothly. Once more, the YK200 motorised yoke provided flexible coverage of the room, as well as projecting onto various areas from the one fixed projector position." As for the Christie MicroTiles they were used for the first time during a German TV live show. MicroTiles are high-quality small DLP projection cubes with LED illumination that can be cascaded to various display sizes. Da Costa admits to having been curious: "Once more, I was looking around for new products and the high resolution attracted and interested me." With a diagonal measurement of 20 inches, MicroTiles offer a resolution of 720 x 540 and a pixel pitch of 0.567 x 0.567mm. Since MicroTiles can be set-up in completely different configurations, they permit entirely new stage sets that extend far beyond a simple background. Da Costa adds: "What I find special is the modular setup of the system, which allows artistic freedom in light and video design; this made it possible for us to create the stage concept by freely arranging the elements dynamically and randomly. An important point here was emphasising the spatial depth on the stage." With excitement already running high before the start of the final show the fact that MicroTiles were being used for the first time added to the atmosphere – and everything ran smoothly. At the front, the stage podiums were appropriately adapted with the aid of the 3D stage crew. CT Germany had laid a DVI glass fibre cable in the studio in advance for connection to the Christie MicroTiles so that they could be fed using the planned signal route. At this stage in the preparation, the team still had a lot of work to do. During the show, all systems were controlled via a grandMA2 console by video operator Björge Block, with all content running through the Hippotizer media server system. There was respectively one DVI signal path for the projector and one for the MicroTiles. Undoubtedly, MicroTiles proved their value in a live situation – not only as an eye-catcher, but in their ability to enhance what was already an exciting stage into something even more dynamic.